You know those gorgeous green juices in the stores that make you feel like you are the epitome of health, they’re at a minimum $5…uh no. I don’t know about you but I’d rather not pay that much for some green stuff. So, I decided to make my very own for less than $2.50 per serving! And no, you don’t need a fancy gadget that costs you an arm and a leg and takes forever to clean. As always, I’ve given you a break down of the written instructions and ingredients as well as step-by-step pictures! Not only is this juice recipe simple but the clean up is even easier! Let’s get started! I have linked to some products for your reference and convenience. Some of the links are affiliate links, which means as an Amazon affiliate I make a small commission at no extra cost to you. high-speed blender or whatever you have on hand- I personally use a Ninja and LOVE IT!! I’ve had it for years and use it for everything! I now use this juicer and am OBSESSED with it! So if you don’t mind spending a little extra, I highly recommend this juicer. Directions: we’re keeping this simple, easy and enjoyable! Cut up your lemon and apples, this helps with the blending process so you don’t have to blend forever! Add spinach, lettuce, apples, and water to the blender. Squeeze your lemon into the blender using either your hands or the lemon squeezer. The lemon is imperative to the taste of this green juice! Blend it all up and make sure there are no chunks left in the blender. Grab your bowl and place the nut milk bag in the bottom of the bowl with it open as wide as possible. Pour the juice from the blender into the bag. Again, if you want to make this even easier, I highly recommend this juicer from Amazon. Use a funnel to pour the pressed juice into the cup of choice and enjoy! That’s it and now you have a delicious, simple and healthy pressed juice that you can make time and time again! And if you’re anything like me, you don’t really like veggies, but I know I needed to find a way to get them in, so this juice is perfect to get in some much-needed vitamins as well as make you feel like a green juice goddess! If you make this recipe let us know! And don’t forget to share it with your friends and family! What’s one of your biggest goals for the new year? 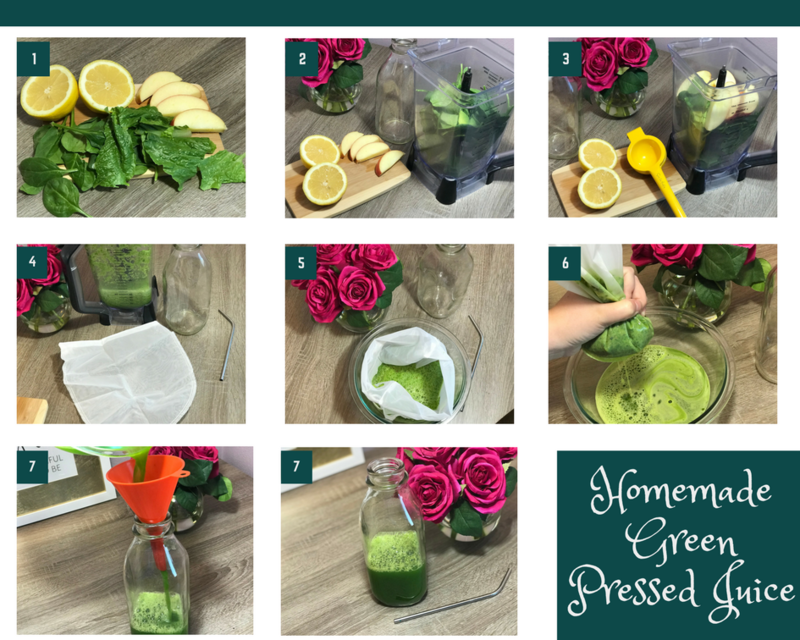 We make green smoothies every morning, but I never thought about doing juice instead. I’m going to have to try this! Our lemon tree is full of ripe lemons right now and I’ve been trying to think of things to make with them. I love green smoothies as well but there’s just something about cold juices in the morning! That’s fantastic! I hope you enjoy this recipe! This looks so healthy, delicious and fresh! Love it for my New Year’s resolutions. It’s so refreshing and a perfect way to start your morning! I’ve never tried any of these green juices. It actually sounds like it would taste pretty good with the apples and lemons added!!! Some of them can taste a bit more earthy than others depending on which veggies and fruits you use but I love this one! The lemons seem to tame the spinach taste and the apples are delicious and sweet! We hope you enjoy this recipe! Is there a particular blender that you recommend??? The one we personally used was the Ninja brand blender but I would say any high-speed blending or just a regular old-fashioned blender would just fine for this recipe! This sounds good! I like adding spinach to smoothies because I can barely tell it’s in there. Thank you. We agree, plus it’s a great opportunity to extra Vitamin A and K and some minerals too! Great recipe to try out! I love trying new healthy drinks – especially at the start of the new year! Thank you, we love looking for healthy foods and drinks too. Hope that you try this one and enjoy it! Saving this so I can try these out! Hope that you enjoy this tasty drink! Thank you and hope that you enjoy it!